It's been sweltering hot outdoors these past few weeks. Not good conditions for a vegetable garden. So today with my best three-year-old helper at hand we got an early morning start. Even so, we were hot and sweaty in no time. I knew you wanted to know that little bit of trivia. We adjusted one of his Papa's hat for the little one to help keep the sun rays out of his face. He's an eager gardener... always ready to help. 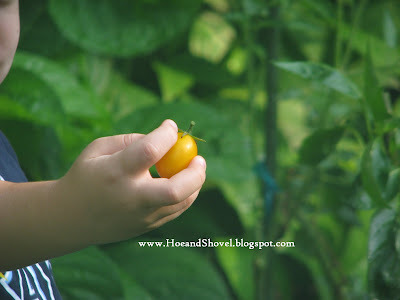 His very own tomato plant has yielded some juicy 'morning sun' heirloom yellow tomatoes. He gets so excited about them he just eats them right there in the garden as fast as he plucks them off the vine. I prefer the taste of the 'black cherry' grape tomatoes. I've mentioned here before that even though none were officially planted in spring several came up on their own. If only tomato plants lasted as well and as easily as they get started. Notes for the veggie garden journal: must figure that one out. 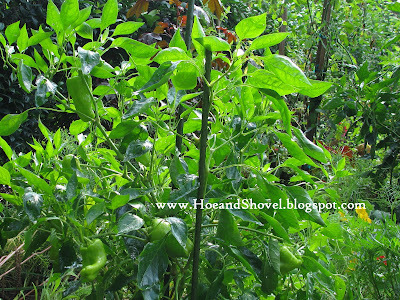 Cubanelle peppers are thriving but the squash and zucchini are long gone. The succession green beans are giving us enough to add to a meal but not enough to give extras away. We pulled up most of the remaining carrots today. I've only left them in the ground in an attempt to prolong the use of them. I planted lots more this season than last but honestly they aren't as sweet now that it has turned so hot. No matter. My little guy has so much fun pulling them up it is worth leaving a few a little longer just to share the utter joy with him another time. 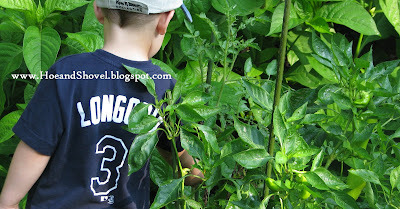 After we watered and picked tomatoes and pulled carrots we noticed some very healthy pole beans hanging on the vines. The vines of those beans are not at all attractive at this point. My little fellow went right to work pulling those, too. 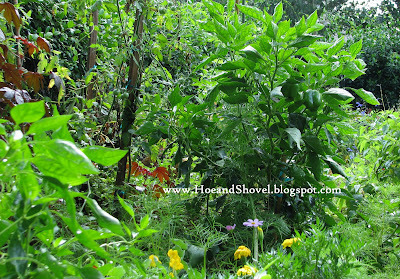 Then it was around to the back yard where we do have some squash and okra planted among the flowers just for fun . It was all about watering dry and thirsty plants today, a little baseball and of course cooling off with a swim. Afterall, it isn't just about the work on Saturday morning. Overall the vegetable garden isn't looking anything like it was in its prime a month ago. But amazingly it keeps giving us some produce. As long as it keeps making efforts we will keep nurturing it. 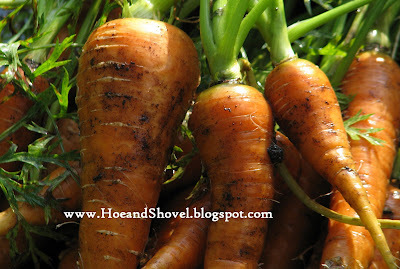 For more blogs with vegetable garden updates go have a look at Tina and Skeeter's blog. It was about time I joined in for their monthly garden review... but this very well could be my last entry since my vegetable garden is rapidly declining. Love your helper Meems! He is too cute give him a big hug for me. Yes it is sweltering hot down here too and the rain is just teasing me with dark clouds and brief sprinkles. Have a great Sunday! Oh My Heart... Pole Beans are my very favorite green bean. I love to cook them with some bacon and add red potatoes. YUM!!! You have a great little helper.. Love his hat!!!!! Sounds like he's gonna be a gardener like his Grandmother. It's hot here too... Yuk!!! Hi Meems~ I had heard that the south is in the midst of scorching weather. I bet you're really glad for all your trees. I hope it lets up soon. Your "helper" is adorable. I love the photo of him grabbing HIS tomato. Such a precious age! oh Meems, you are really talented veggie grower. your peppers look so lush and healthy! Mine got stuck and stopped growing. I wonder why. I am sure you got lots accomplished with your best helper at your side. What fun for you both. Plus he gets to learn where food really comes from. I am always amazed to see your carrots. I have tried to grow them before and haven't had luck. We are having some of that intense heat right now, too, meems. It's hard on the garden and the gardeners. Your helper is adorable....How fortunate that he lives close enough to regularly help in the garden...I am totally with him on snacking straight from the garden. Yummy on sun warmed tomatoes! This heat is ridiculous!Where are our summer rains? Even our eggplant plants are suffering.The only things doing really well in our veggie patch are the peppers and cherry tomatoes. The cute little helper you got there! He really is at that age where he wants to get right in there DO everything I'm doing. So good to have him by my side. The rain teased us for the last two days as well... all around us but didn't land ON us. Such is summer. You enjoy your Sunday, too. This is what it's like on a typical July or August day. It's too bad it has started so early. The veggies definitely aren't keen about it. The trees help keep the sun off and if there happens to be a breeze they are a life saver. You are SO right about this age... it is perfectly perfect. I never think much about the peppers being successful since they seem so easy to grow here. With or without me. Yours must need some of our awful heat and humidity to help them grow. HA. Whenever there is water involved he is on board. He will play with those buckets and hose for a very long time. It was so hot that he ended up getting soaked in the hose by the time we moved around to the back yard. He thought that was the best. But he lasted out there with me for over 2 hours. It kind of helps to know that the carrots do well here... I just assume everyone that grows them has the same results. My focus seems to always be on what 'doesn't work.' I wish tomatoes were as easy. It is just too early for this kind of heat. Hopefully we'll get some kind of front to relieve us (and you too) soon... even if just for a little while. The tropicals love it but not the veggies. My little helper figured out popping those little candies in his mouth right away. We rinse them and eat them for our morning snack... So blessed he is here so often. Did you get the hail storm Wed. night? Lots of wind and rain - which was the first we had in over 10 days. Now nothing since then. With this heat we need rain for relief. So there is a lot of dragging hoses going on. Even my grape tomato plants are toppled over and now growing downward but I'm letting it happen and not trying to fight it anymore. I think I'm going to grow them upside down next season??? I have been intensely in the garden the past couple of weeks. Several nights I've stayed outside until just after dark and with this kind of heat I'm still dripping wet with, well... it's definitely SWEAT... not perspiration... it is plain ole stinky SWEAT. WAY too humid for humans. The pool is my friend. And my little helper was dripping too... he's never stinky though... just cute! It IS amazing indeed! So many vegetables and to think you only started it a few years ago. I can see why it is such a joy for you. The littlest helper is too cute. I can't blame him for eating up those yellow tomatoes. And you know, I sympathize with you guys on the sweat. It has been so muggy lately. Looks great! I added your link in and I'll come automatically and check you out. Wonderful veggies-especially all those carrots. You rock! I know, my garden is starting to turn as well, but I'm still getting wax beans and peppers so I haven't turned them under yet. I can't believe those wax beans- they just keep on coming! I think I'll skip the green and pole beans next year and just plant these. Your helper reminds me of my nephew! I'll get him down here in the fall to help me I'm sure! Meems, what a joy to see such an up and coming young gardener! I couldn't help but think of all the meomories you are creating with him. We have had a taste of your weather here he last few days-UGH! I am not enjoying it. I much prefer the cooler than normal days we were having. 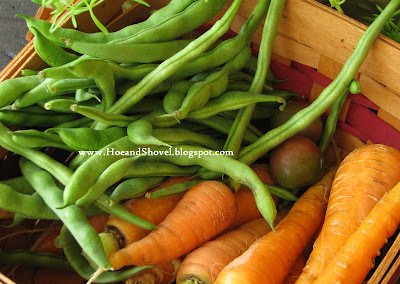 Even though your veggie garden is winding down the 'fruits' still look wonderful. Enjoy! Your little helper is growing up fast. It's cute to see the sweet changes in your grandson as I look back at your blog. Hope the weekend is relaxing for all in this scorching overwhelming heat. Say hello to Mr. Meems! Hi Meems, Just an update on the tomato plants you gave me. They are full of tomatoes. I will try to send some pics. 2 are orange grape tomato's and 2 are big ones but I don't know what color yet. So the babies are growing up! I'm hoping they survive the heat. It's nice to have a helper in the garden, and he looks like a real good "little" helper. It was 90 degrees and VERY muggy this morning at 9 in the morning... that's hard to get away from. Maybe we'll get some rain tomorrow and a little relief... none in sight for today. I've wanted to remember the 20th so many times and it got away from me. This will probably be my last harvest unless the peppers and okra hold out... we'll see about it next month. Thanks for hosting and encouraging everyone who grows their own produce. It is a very rewarding effort. I couldn't be without my green beans. They are just so crispy and yummy fresh. I SO wish they would grow all summer. Next year I need to put some up in the freezer... just too much to do this year. I haven't tried wax beans and don't really know what they are... will check them out since you've done so well with them. We know there's no chance we will see "cool" here for a few months... the heat is on and it's here to stay. My little guy is soaking in all the garden knowledge... I have to say he is a smart one. 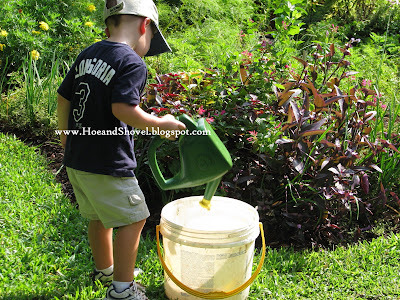 We'll have to keep reinforcing garden info for him to retain... I hope he has the garden bug. We had baseball games (older grandson) to watch in this heat... those poor little fellows playing in the middle of the day. Father's day was relaxing but still hot in the late evening working in the garden... whew! You know exactly what I mean. My little helper is probably a bit more efficient in the garden than your cat. HA. Yes, my little guy is full of questions and these days he has the answers too... you know how that is. He's a ball of energy... always on the move and keeping me moving. That's a good thing. I am SO impressed! Your orange one is the yellow one my little fellow is holding. It is called morning sun. The other ones will be red and hopefully they are Floridade. It is an heirloom supposedly adapted to our environment and hopefully will ripen for you. 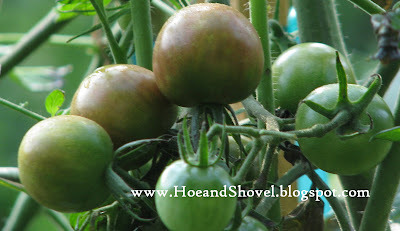 Tomatoes don't like this heat... actually they don't like it when the soil heats up like it has. Keep me posted... I'm so proud of you! As long as I'm using water I have his attention. He has helped me dig on occasion, too. Because what is better than digging in the dirt for a little guy... only getting soaked with a stray spray nozzle on a sweltering day. 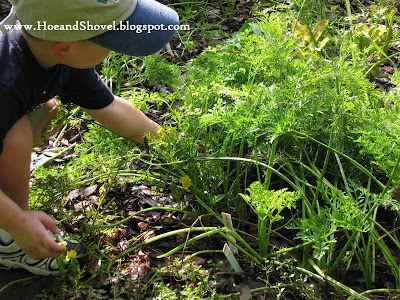 Such a wonderful blog you have about your garden! I'm glad i found it. I am curious about your name, Meems. Is it a nicname . . . what does it mean?